One upon a time, there was a Novation keyboard called the ReMOTE SL. That’s as in “remote control” of software. Times have changed, and you’ve got a bunch of gear to connect – and you may want your keyboard to work standalone, too. So meet the SL MkIII. The additional features are significant enough that Novation is dropping the “remote” from the name. Now it’s just SL, whatever those letters are meant to stand for. The story here is, you get a full-featured, eight-track sequencer – so you no longer have to depend on a computer for that function. And Novation promise some higher-spec features like expanded dynamic range (via higher scan rate). With lots of keyboards out there, the sequencer is really the lead. Circuit just paid off for keyboardists. Novation gets to merge their experience with Launchpad, with Circuit, with Web connectivity, and with analog and digital gear. The 8-track, polyphonic sequencer is both a step and live sequencer, it records automation, and you can edit right from the keyboard. Clock/transport controls for MIDI and analog, which also run standalone – route that to whatever you like. And of course there’s more mapping options with their InControl software and Mackie HUI support. Novation must know a lot of their customer base use Ableton Live, as they’re quick to show off how their integation works and why those screens are handy. 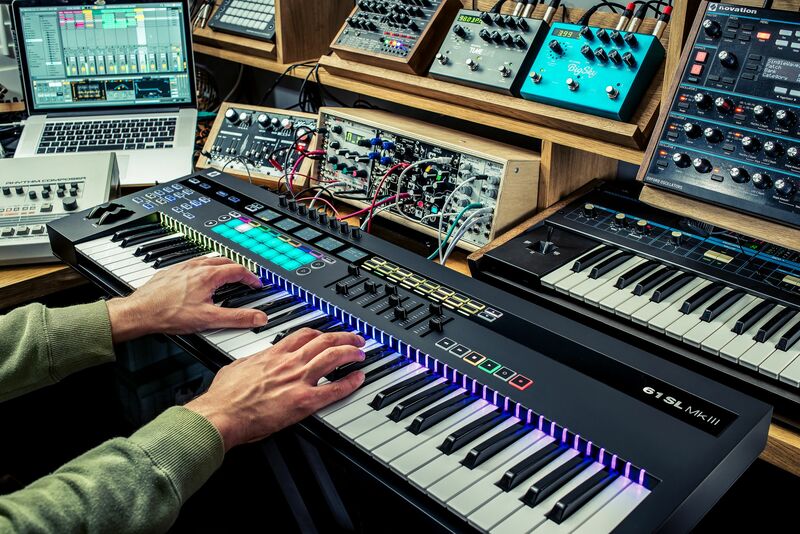 We also see some cues from Native Instruments’ keyboards – the light guide indicators above the keys are copied directly, and while the pads and triggers are all Launchpad in character, we finally get a Novation keyboard with encoders and graphic displays. Unlike NI, this keyboard is still useful when the computer is shut off, though. And wait – we’ve heard this before. It was called the AKAI Pro MAX25 and MAX49 – step sequencer built in (with faders and pads), plus MIDI, plus CV, plus remote control surface features. You just had to learn to like touch strips for the faders, and that garish racecar red. That AKAI is still worth a look as a used buy, though the hardware here is in a more standard layout / control complement, and a few years later, you get additional features. The big rival to the Novation is probably Arturia’s KeyLab MKII. It also strikes a balance between studio hub and controller keyboard, and it comes from another maker who now produces analog synths, too. But the Novation has a step sequencer; Arturia makes step sequencers but left it out of their flagship controller keyboard. Oh yeah, and if you just wanted an integrated controller keyboard for your DAW, Nektar have you covered, or of course you can opt for the Native Instruments-focused Komplete Kontrol. Each of those offerings also got revisions lately, so I’m guessing … a lot of people are buying keyboards. What keyboard strikes your fantasy at the moment? What do you want a keyboard to do for you? Let us know in comments. The post Novation’s SL MkIII has it all: sequencer, CV, MIDI, software control appeared first on CDM Create Digital Music. The post Heavy Metal Techno: JK Flesh On Futurism, DIY Culture And The Beauty Of Non-Music appeared first on Telekom Electronic Beats. September’s selection of the world’s best mixes features artists in dialogue with their younger selves, low-slung dub chuggers, an emerging new Chicago name and gleeful Dutch soul-house.